Here's an eye-catching recipe for spaghetti squash marinara that's sure to please your senses as well as make your family, friends, or potluck crowd jump to their feet and applaud (this post has been updated 9/13/17). The other day I wanted to have pasta, but discovered long ago that eating semolina (a form of wheat that most pasta is made from) makes me feel bloated or sleepy or both. Some might say I have a gluten allergy, but I like to call it gluten sensitivity. I know what's good for me to eat and what isn't. I'm in tune with my body and my body is in tune with me. Anyway, as luck would have it, I spotted this fresh organic spaghetti squash on sale at my local Market. Yahoo. I couldn't wait to get it home. Since there was going to be just the 2 of us (hubby and me) for dinner, I decided to cook the whole squash, string it, but transform only enough of it (2 days' worth) to make a Meatless Monday meal and Fun Tuesday meal. On the first day I served it for dinner. The following day I presented it at lunch and got rave reviews. The real reason I know it was good, was because my hubby wanted to eat it two days in a row and wanted two helpings each time. 1. Preheat oven to 400 degrees Fahrenheit. Wash the outside of the squash under cool water (use a vegetable brush to scrub dirt off). Put squash in a baking pan on its side. Pour in enough water to come up 1/2 inches so squash doesn't burn while it roasts. 2.Pierce the squash in a few places with a fork, so it releases any trapped air. This avoids having it explode, while it cooks in the oven. I cook all squash uncut, because I find it's hard to cut it in half or remove peel. No need to peel it. You can string it without removing peel. 3. Roast the squash whole, anywhere from 30 minutes to an hour, depending on how large it is. You'll know the squash is ready, when its skin starts to turn light brown and the fork you use to pierce it goes in easily. If you cut it open and it's hard to string it, don't hesitate to cook it for a few more minutes. 4. Slice the squash lengthwise like the photo below indicates. Remove pulp and seeds by scooping them out with a spoon or knife. 5. 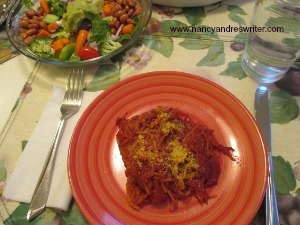 Take a fork and string the cooked spaghetti squash like I did in the photo below. 6. 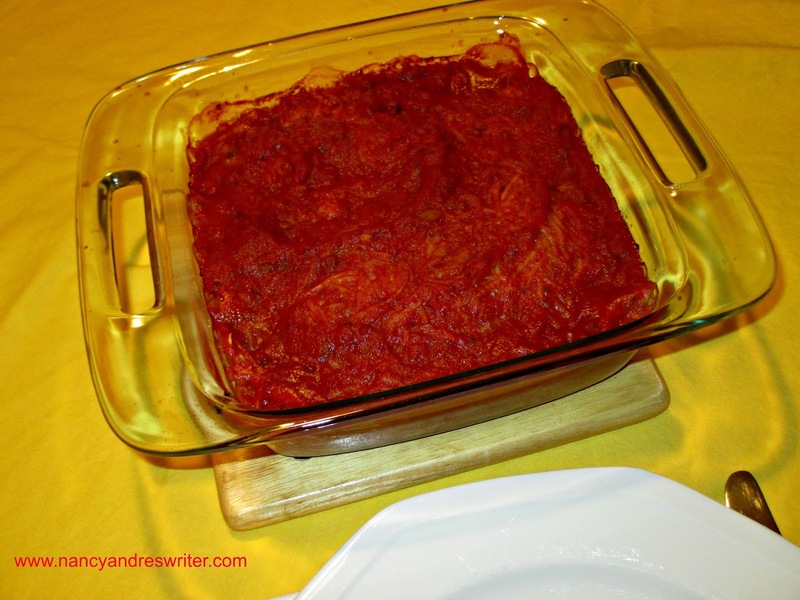 When half the squash was prepared, I put the strings of spaghetti squash into a casserole dish and mixed in the marinara sauce. I made my own marinara sauce and let it simmer on the stove top while the squash cooked in the oven (use ingredients mentioned in the link above). After both parts of this recipe were cooked properly, I combined them and reheated it. I served each portion with a little bit of nutritional yeast sprinkled on top. Here's what it looks like both as a lunch and dinner main dish idea. I portioned out the remaining squash into freezer containers (without sauce) and put the containers into the freezer. Next time I want to serve it, I'll defrost and heat as much as I need. It can be used as a quick fix veggie or added to soup for its nutritional benefits and texture. Another way to mix it up is to incorporate the spaghetti squash into a simple sauté, one made from a clove of minced garlic, a teaspoon of organic olive oil, and fresh chopped basil or other fresh herbs like oregano, tarragon, or cilantro. 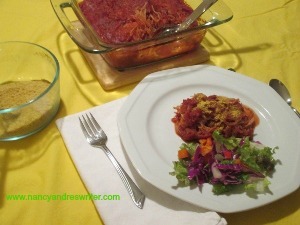 Perhaps you'd rather top the spaghetti squash with Arrabiata (spicy) Sauce or Primavera (loaded with fresh veggies like carrots, red pepper, peas, string beans, onions) Sauce. Use any extra tomato mushroom marinara sauce on string beans, in soup, veggie chili, or any time you want good taste and added antioxidants. Squash is so versatile and economical. You'll probably be surprised at how many ways you can fix it. 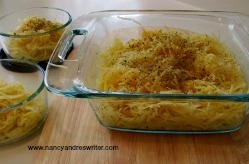 Cooked and stringed spaghetti squash keeps well for a few weeks or even months in the freezer. Once defrosted, it tastes yummy, prepared as I mentioned above. 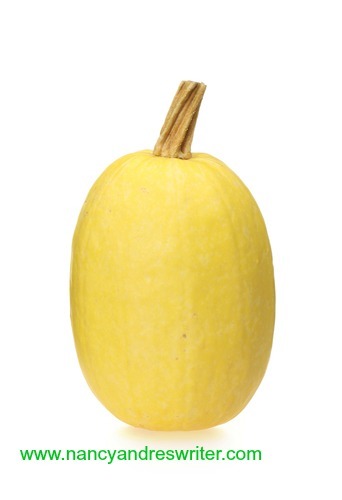 Plain cooked spaghetti squash contains only 42 calories per cup. That's much fewer calories than regular pasta (220 calories per cup). 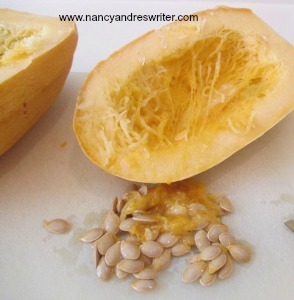 It's low in saturated fat, very low in cholesterol and a good source of Niacin, Vitamin B-6, Pantothenic Acid (B-5), Potassium and Manganese, and a great source of Dietary Fiber and Vitamin C.
Have you ever made spaghetti squash? If not, are you inspired? 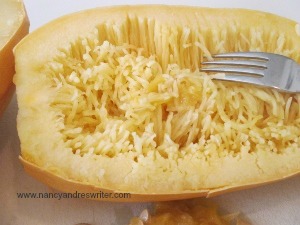 If you've cooked spaghetti squash before, how did you prepare it? 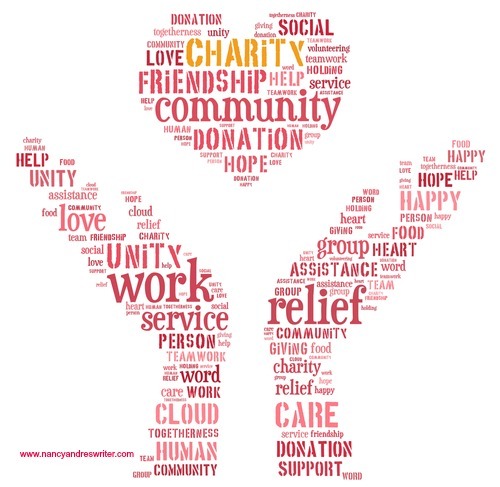 Please share your comments, questions, and get social with me. I'd love to hear from you. will light up the world. Check out my Facebook Page to Get More Tips for Good Eating and Wellness Here . 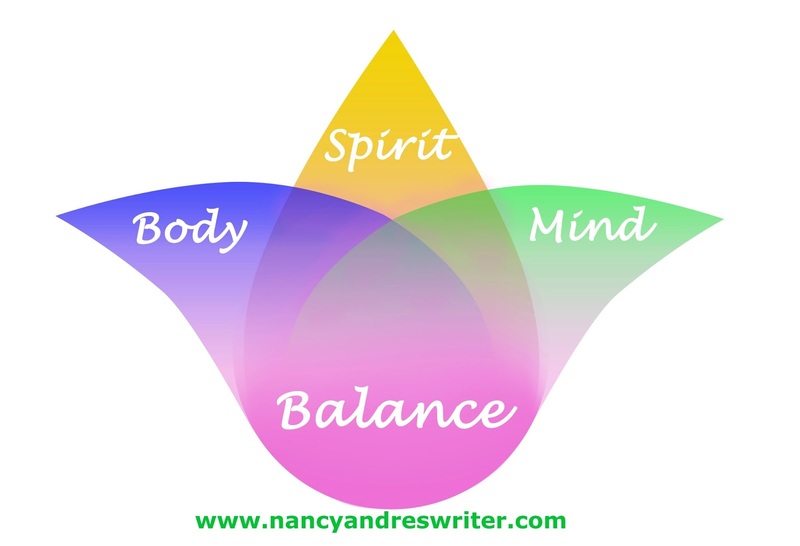 You're Invited to a Presentation by Nancy Andres, Author of Colors of Joy: A Woman’s Guide for Self-Discovery, Balance, and Bliss. 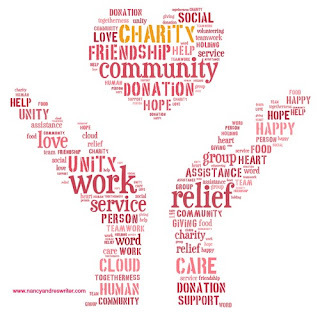 It's a fun way to “try out” Self Care Practices that increase joy in daily living. 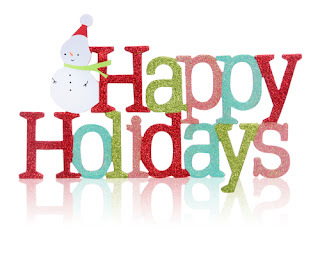 Where: Natural Grocers, 7220 E. Broadway Blvd., corner of Broadway at Kolb, Tucson. 520-885-6000. What: Interactive activities, self-development skills, and time after the workshop to see and purchase Colors of Joy, the woman’s self-care journal. Colors of Joy expands and enhances techniques you’ll learn during this workshop. Details: The workshop is free, but seating is limited and on a first come first serve basis. Open to adults only. www.nancyandreswriter.com. Come on down and enjoy this fabulous self-care party.